As you enjoy these new products there is even more! You can review the amazing products you received to earn points. With these points you can be on your way to trying more great new products at a new low price! Enjoy and earn :) seems pretty simple. Now what I love best..their boxes are available in a Vegan option as well as a 100% Gluten free option! Each monthly box will also include great tips for healthy living as well as great ways to use your box. Conscious Box Subscription has offered several great things for my readers this month. First of all they would love to offer every single one of you a 50% OFF discount for any Conscious Box subscription. Use code: DISCOVERNATURAL. That in itself is an AMAZING deal. Now I know you are thinking hmmm...the title says giveaway. 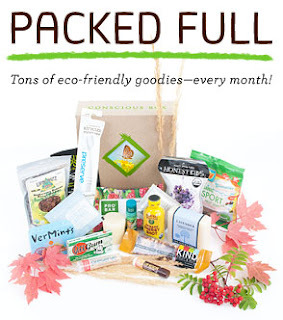 Conscious Box Subscription has offered to giveaway a 3 month subscription to one lucky winner! That is a $59 value with so many other amazing benefits. Make sure to enter on the Rafflecopter below! I like that you can rate products and earn points. they only employ American workers who receive fair wages for the packing and shipping of boxes. They have Ancient Minerals and Agrolab products. You can also get points for taking polls. I learned that they think providing a living wage is important. I love that you can get Get content on daily living tips, exciting monthly themes, and creative ways to use your box!